The width of the lot is 66 feet and there is an 8 foot setback on either side. Simple math calculates that the maximum width of the structure is 50 feet. Our actual width is 44 feet, 6 inches. 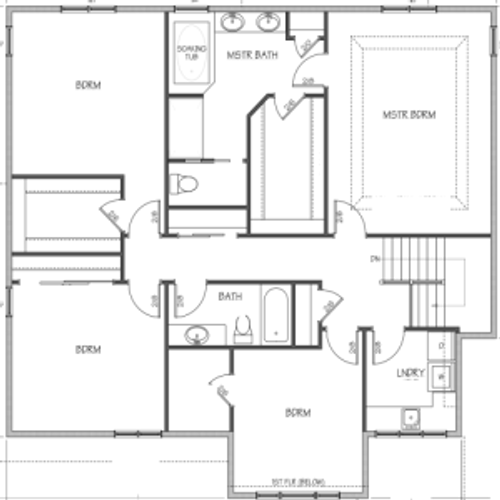 The footprint of the house is nearly a square -- 44'6" x 39'0". A square shape gives the most area with the smallest perimeter. For us, this minimizes siding costs and heat loss through walls. The footprint is further minimized by utilizing nearly all of the space above the garage for the second floor. This results in a lower cost per square foot as compared to an essentially standalone garage. The big savings here is on roofing. This is also a "greener" design because it minimizes the amount of impervious surface area. We wanted a second floor laundry. This isn't a "green" consideration, but rather a reflection of the reality that laundry originates from bedrooms and bathrooms, and carrying it up and down the stairs is tedious. We wanted a second floor master bedroom, to keep bedrooms more isolated from living and entertaining areas. We wanted to minimize what we see as "wasted space"; for example, a desk or study in a hallway, bump-outs in rooms with little practical value, and so on. By focusing on maximum efficiency, we reduce costs and building material use. 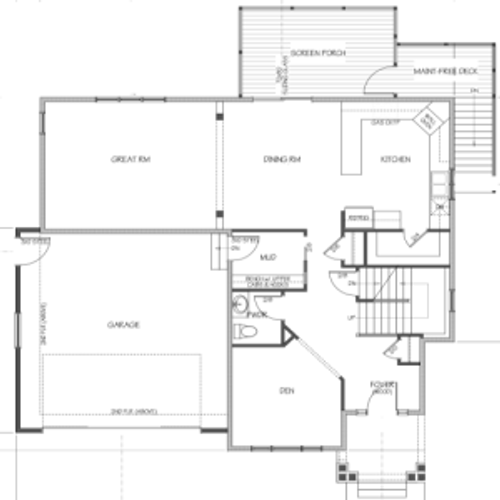 Without further ado, we present the first and second level floor plans for the home.